By 2018, we assume everyone knows that the most valuable position on the football field is quarterback. In fact, our data shows that Drew Brees has been almost three times more valuable than any position player this season. So if we were to simply rank the most valuable players in the NFL, it would just read like our quarterback rankings this season. With that in mind, let’s identify who’s been the most valuable non-quarterbacks with PFF’s WAR (wins above replacement) metric. 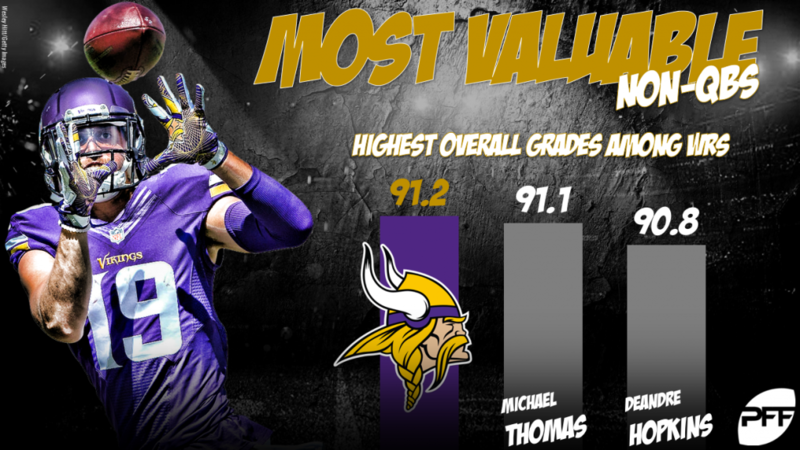 The single most valuable non-quarterback this season, Thielen consistently adds value to his targets. He leads the league with 63 catches, and his eight touchdown catches are the fifth-most among players. He’s tied with Antonio Brown and Julio Jones for the most targets in the NFL (121), yet Kirk Cousins’ 120.5 passer rating when throwing Thielen’s way is far better than both Jones (102.8) and Brown (80.4). If you can figure out a way to slow him down, let an NFL defensive coordinator know. Barkley’s receiving ability was always his most coveted asset coming out in the draft, and that’s why he leads all backs in W.A.R so far. He’s second among running backs with 84 targets, yet first with 25 broken tackles and only James Conner has broken more than 15 tackles after the catch this season (21). Of course, he’s also been a devastating home run threat as a runner; 414 of Barkley’s 829 rushing yards this season have come on runs of 15 or more yards – the second-highest percentage among all backs. The most valuable thing an offensive lineman can do is not take downgrades. Negative grades often lead to negative plays, while positives aren’t as correlated to success. So far this season, the Saints’ right tackle has done exactly that at the most volatile position along the offensive line. He’s given up only nine pressures all season long on 379 pass blocking snaps. That 2.4% pressure percentage trails only Alejandro Villanueva and Mitchell Schwartz among tackles. Combine that with the third-highest run blocking grade at the position, and you have the one who’s added the most value through 12 weeks. It’s like he’s playing a different game from everyone else along the defensive line. 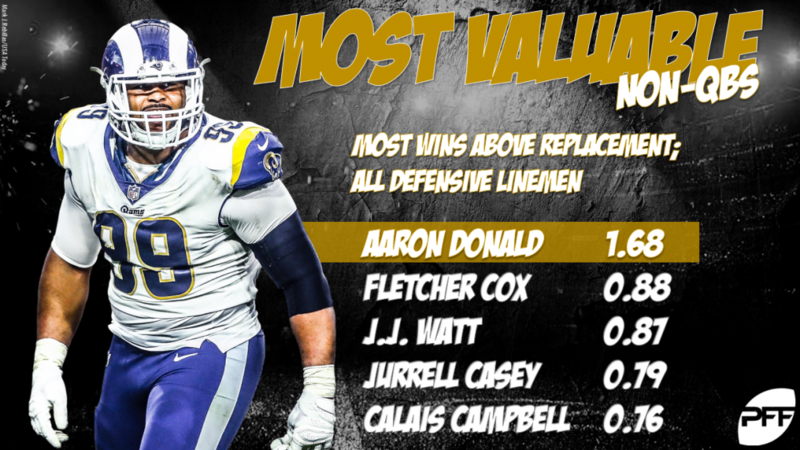 Donald’s 77 pressures so far this season are 16 more than the next best player, and he leads the NFL with 15 sacks as an interior player. Those numbers are unheard of, and he somehow continues to exceed already lofty expectations. There is no surer a tackler in the NFL right now than Wagner, and this isn’t a debate, as he hasn’t missed a single tackle on 91 attempts so far this season. Tackling is only part of the equation though. Coverage is king for a modern-day linebacker, and no one has been more sound throughout the season than Wagner in that regard. He’s been targeted 46 times on the season and only allowed 13 first downs – 28 other linebackers have allowed more first downs in their coverage this season. It was a close race between Gilmore and Cowboys cornerback Byron Jones, but Gilmore gets the slight edge because of his playmaking so far. 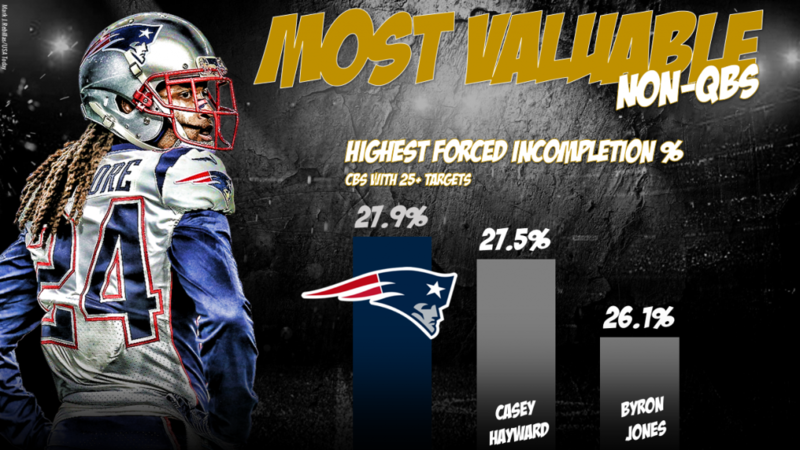 The Patriots corner has forced an incompletion on 27.9% of his targets so far this season – the highest rate of any corner in the league. Targeting him has netted opposing quarterbacks a 70.9 passer rating and 44.3 completion percentage so far.